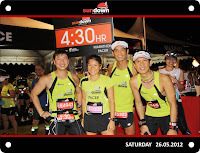 By the time we arrived at the Sundown Ambassadors and New Balance-NightHawk’s booth, excitement was already brewing for the Sundown Marathon 10km start. 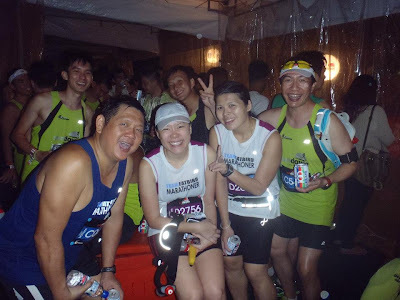 The marathoners (Half and Full) were gearing ourselves up for the mission of the Night – for the Sundown Pacers to bring the Half and Full Marathoners to complete this important night race in their respective target times. 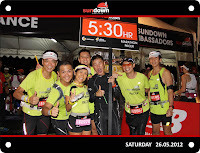 As we moved around, we could see boards and videos of the Sundown Ambassadors and their pace timings on the large screen, adding to the air of excitement for the Sundown Pacer team, the NightHawks and Sundown runners who have gathered at the tent to follow us into the starting Pens. Time passed very quickly with the coordination briefings and deployment of Signage representatives, along with the many group photo sessions. It was a nice touch by the Sundown Organizer to have large illuminated timing balloons and signage for the Pacers to demarcate the various assembly points. Due to the modifications in routes 2 weeks prior to the race, there were a lot more measures put in place to ensure the smooth flow of traffic and proper flow guidance for the participants. A key one was a start of the race in 2 waves, allowing the first wave of (sub 2:30hr & 5hr) to start first, followed by wave 2 (2:30h and 5:00h and after). It was all systems planned, and the only thing that might have affected us would be the rather humid weather in the wee hours as expected. 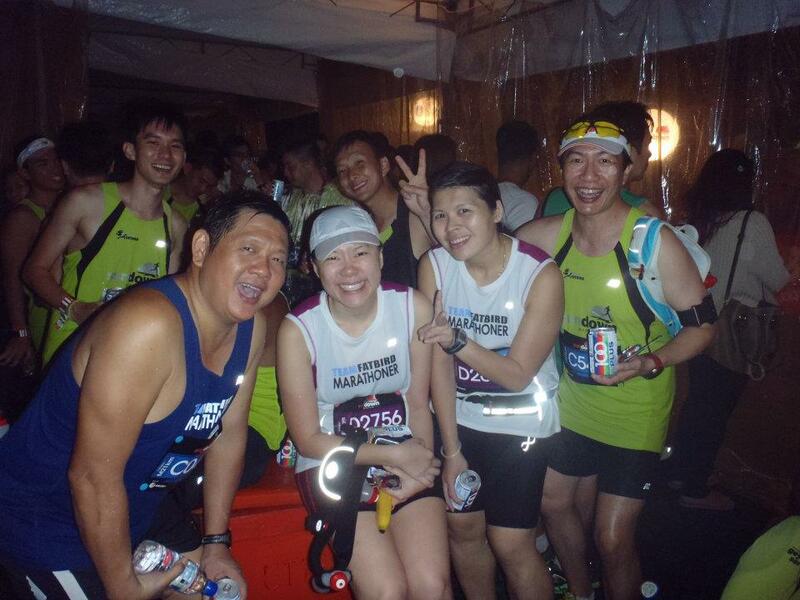 The HM and FM was started at 0030hrs as planned, and with the HM and FM runners alongside one another, it was a new experience. The Pacers had to take care to settle into our Optimal paces, while ensuring the runners were following the correct intended pace groupings. The was not too much jostling about as there seemed to be ample space for the runners to move about. 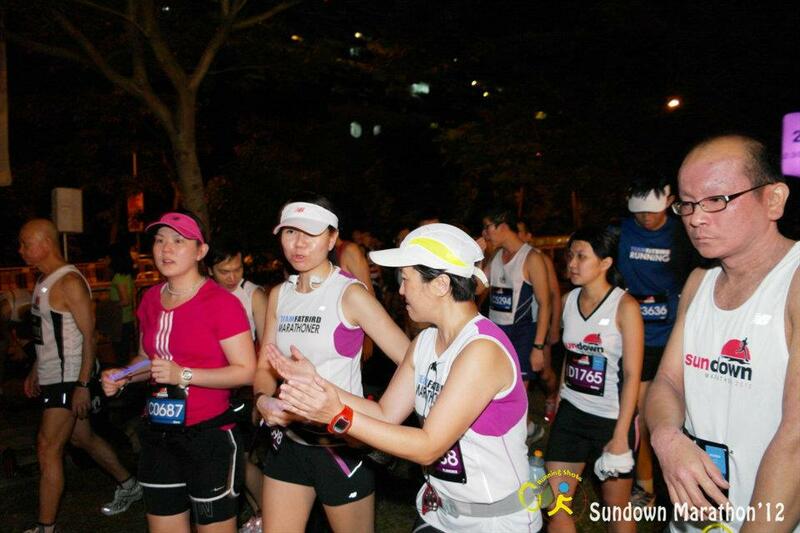 Soon we settled into our steady zones all the way to the 14km mark where the HM and FM took different pathways. 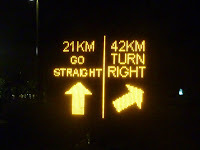 With the very clear instructions from the speakers with lighted directional signs, the Organizer left very little chances for anyone to take the wrong route…bravo! There was more space to manouvre once the 2 groups were split, and we could focus on sustaining our paces to the finish, or for the FM, for the next 1/3 of the race. The ECP stretch, rather dim at certain areas, was familiar territory for many of us doing the FM, as we have had our Sundown lead-up runs and NightHawk training sessions there. Maintaining our sustainable optimal paces here proved to be a lot more challenging at night due to the low visibility and upset body-clocks, among other reasons. We stood true to our race plan and carried that stretch relatively well, with the regular tweaking of momentum to moderate the boredom that was setting in. 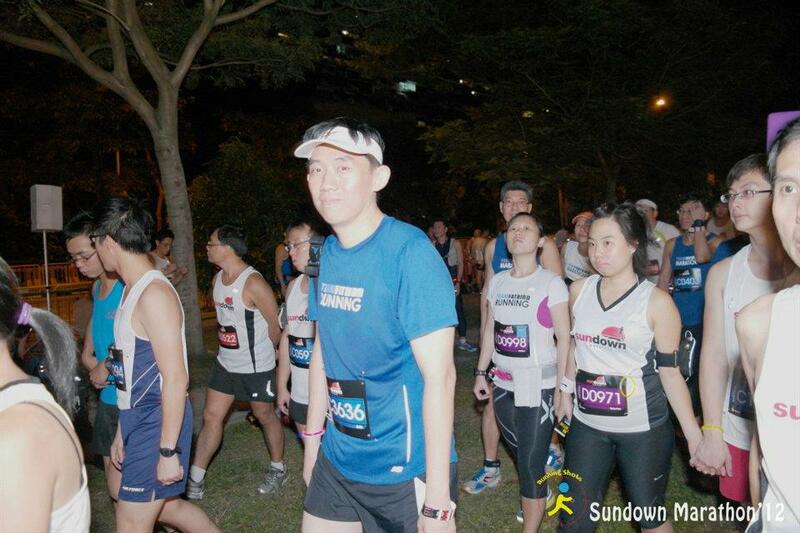 By the 20km mark, we could feel a nice breeze coming on, which turned to stronger winds and red skies by the 25km mark. 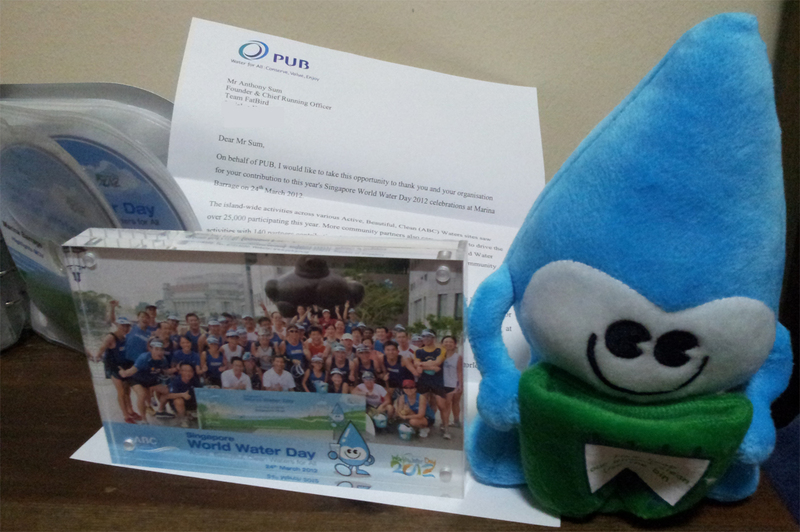 The water points were quite well managed, given the large crowd of thirsty marathoners. 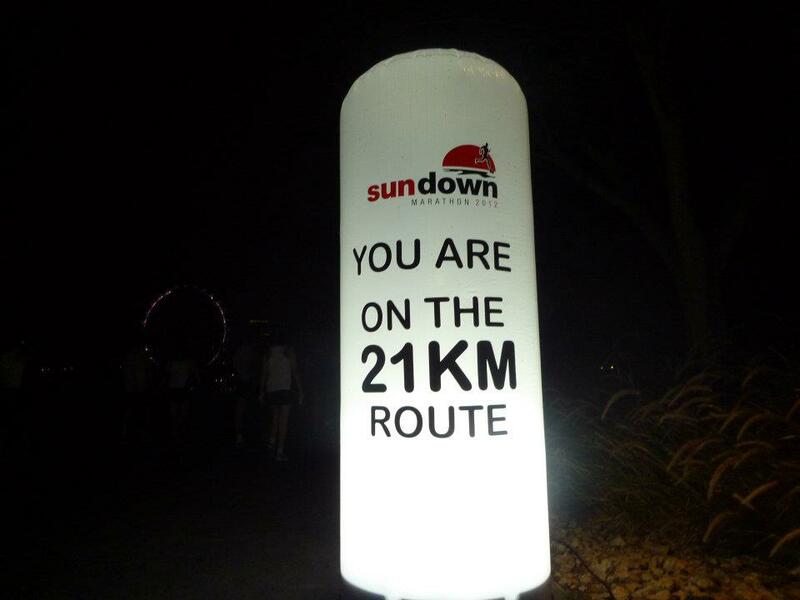 Runners were slowing down by the 21km mark due to the humid conditions. 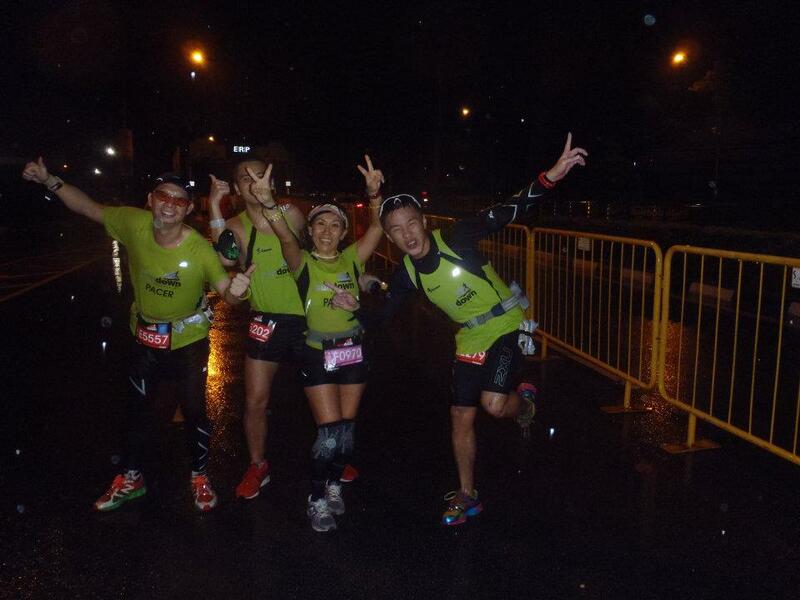 However all that were put to rest when the winds and heavy rains came at around 3:30am (30km mark). The tired marathoners received a good second wind (no pun intended) which gave them the extra perk to get back into sustainable race pace, and soon we were back with a group of runners going for (sub-4Hr in our case). The other Pace Groups and runner followings observed similar pick-ups at about the same time. 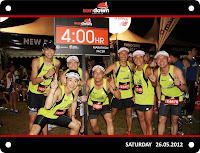 There was a CAT 1 weather warning sent out by Sundown organizer to advise runners to take shelter, just that many were already enroute to the finish and did not have their phones with them to receive the message. 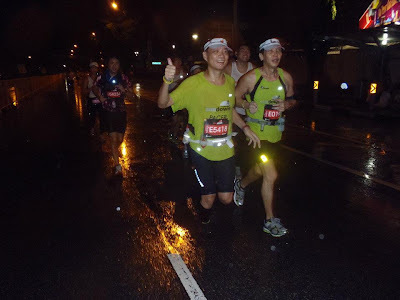 Moreover, the spirits were soaring with the cooling-down effect of the rain, as the marathoners picked up their paces with a renewed possibility of hitting their targets. The final 8km was interesting as the runners began to encourage one another to brave the rain and continue on for the final leg of the race. With 5km remaining, a number of marathoners decided to push ahead for their best timing yet, and from there it was just one steady run all the way to the finish. 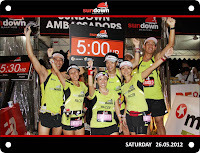 The Sundown Pacers did very well to bring large groups of runners to complete within their respective finish times of 2:00h, 2:15h and 2:30h Half Marathon, and the 4:00h, 4:30h, 5:00h, 5:30h and 6:00h Full Marathon. Whistles were blowing crazy towards the final 500m of the finish as the Pacers encouraged as many of the runners to push for the finish. 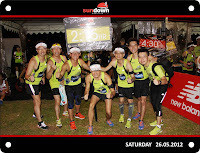 There were many congratulatory messages, happy handshakes and words of thanks and praises for the Sundown Pacers, and all these just lifted the spirits of the team so high we felt we could just go for another 10km….haha. 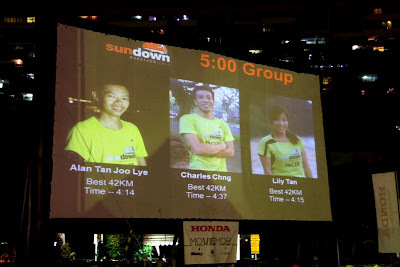 It is the sense of satisfaction of having done our pacing job well and getting the recognition and appreciation from the Sundown runners that have made the role of marathon pacing such an enriching and satisfying one, something which we take as a privilege (to serve) rather than as an assigned task we need to accomplish. 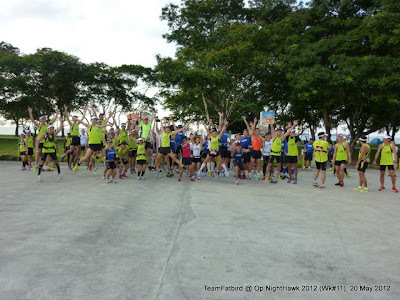 As the NightHawks and Sundown runners return from the races, many positive postings and shouts of jubilation at having good results from the run echoed in facebook and the NightHawk’s Nest (a private area for FatBird’s Sundown Marathon trainees). 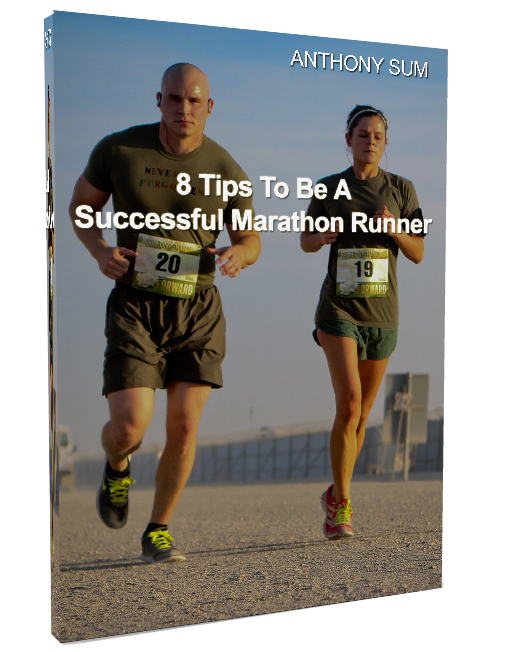 Congratulatory and encouragement messages continue to pour in, lined with words of praise and appreciation for the Pacers and Training Crew continued. 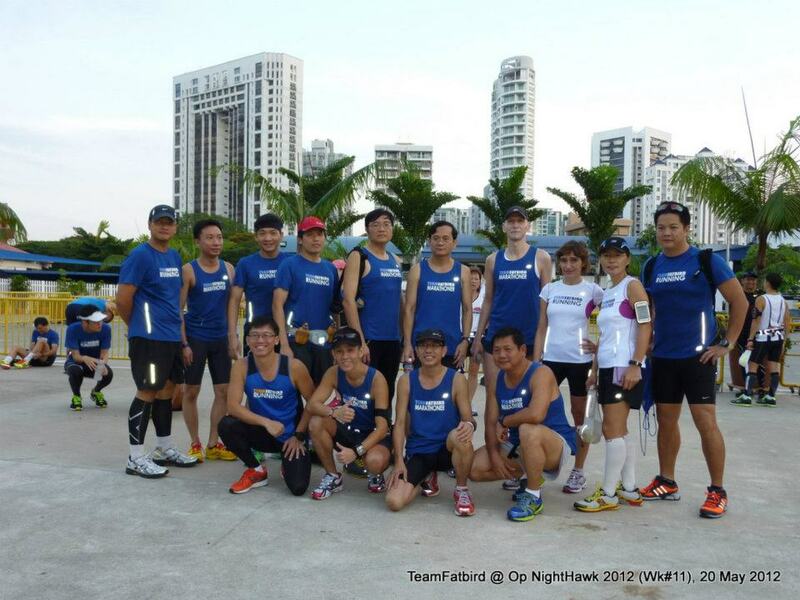 We are glad to hear that most of the NightHawk trainees (now you are Operationally-Ready) and FatBird runners have done well, with many achieving their targets and a number more scoring Personal Bests in terms of timings as well as maiden attempts at the distances. The 15-weeks (SundownPacers/Ambassadors) and 12-weeks (Operation NightHawk) was one exciting journey for the approximately 200 of us, culminating in the successful operations on Sundown Night. We certainly Lit Up The City to convincingly to Beat The Sunrise. 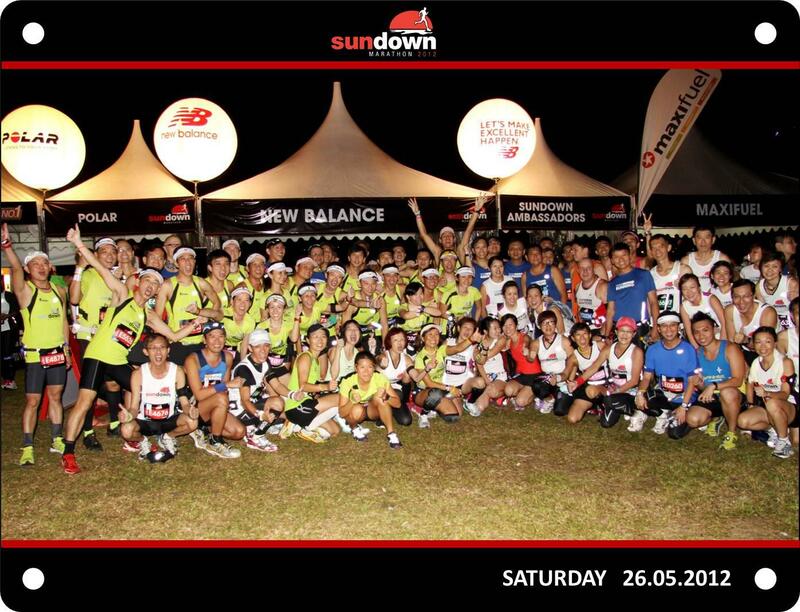 Congratulations to the Sundown Organizer for putting in a good race execution in spite of the challenges of route, terrain and weather, the pro-active participation of the key sponsors like New Balanceand Maxifuel, Polar HRM, and all who have helped and participated in more ways than one in the Sundown Marathon 2012. When Dusk Came, The NightHawks Did Emerge! 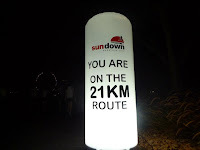 On May 27, 0030hrs, you will be accompanied by the Official Sundown Marathon Pacers who will provide the steady, optimal paces and guidance for you to hit your target finish times. There will be 4-5 pacers in each pace timing group for Half Marathon (2:00h, 2:15h, 2:30h) and Full Marathon (4:00h, 4:30h, 5:00h, 5:30h and 6:00h). 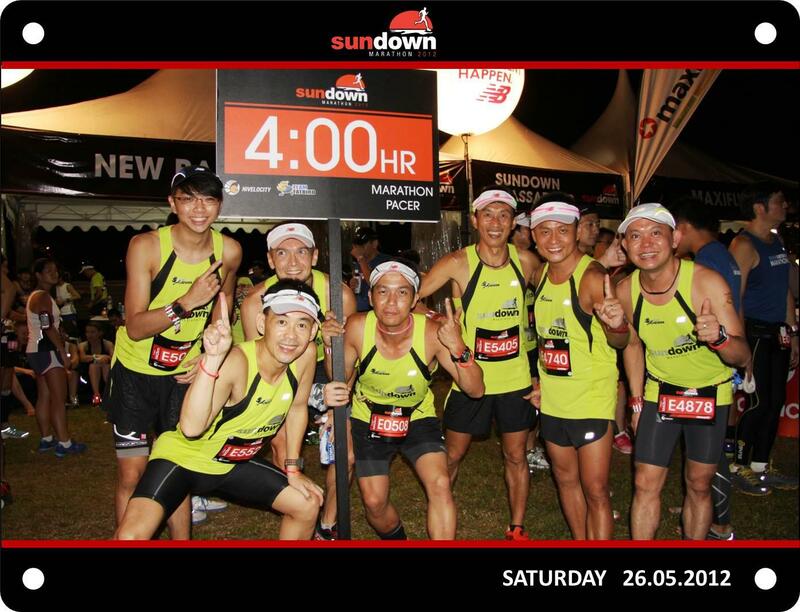 Who are these Sundown Pacers and how will they help you achieve you goal of Beating The Sunrise in your desired completion times. 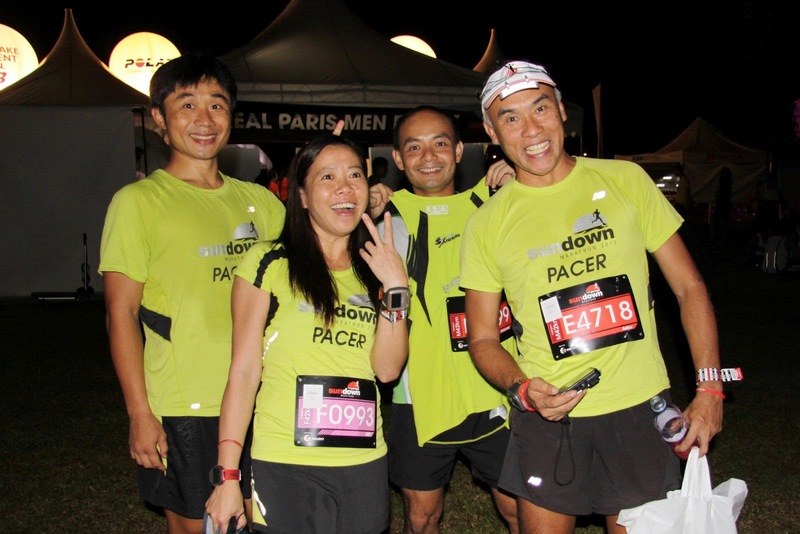 Here’s a chat with some of this year’s Sundown Pacers, where they share the reasons why they have become Pacers, the training journey and the preparations they have made to be ready for Race Night. What inspired them to be Marathon Pacers and what attributes would make a good Sundown Marathon Pacer? 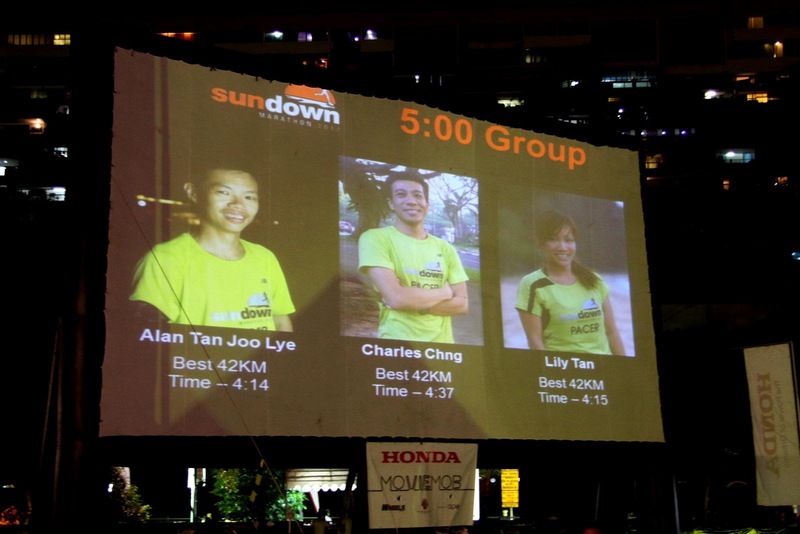 Race Night Tips: What plans and positioning will the Pacers adopt on race night, and how do the Sundown runners identify and follow the respective Pace Groups? Is there a meeting point on Race Night to meet with the Pacers? 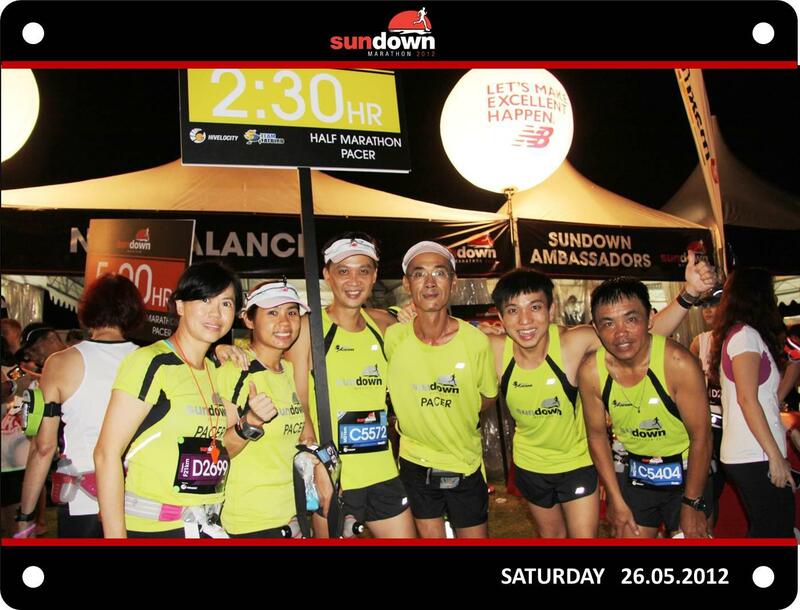 There is a Sundown Pacers & Runners Meet-Up on May 26, 10:30pm at the Sundown Pacers booth (near to the main stage). 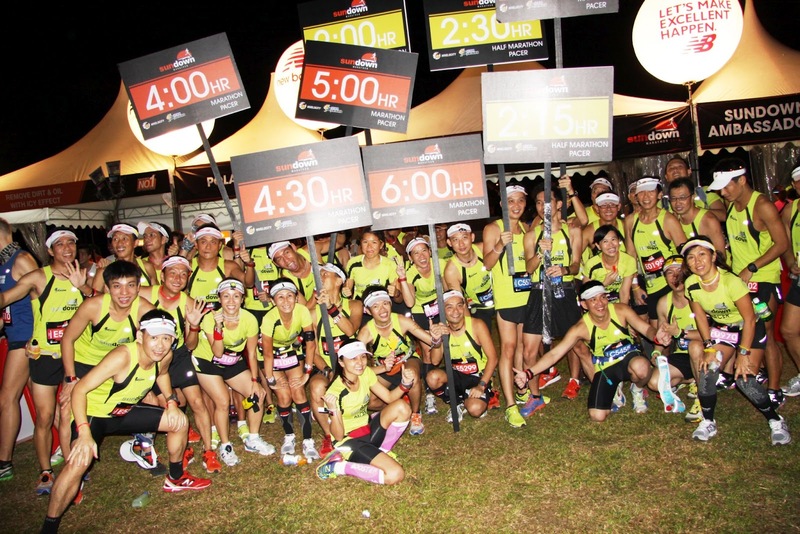 Runners will collect your Pace Bands (with timing splits) and light sticks and have group photos with the Pacers. The Sundown Pacers will walk to the start line with their respective pace group runners and line up in the respective timing pens. It was a relatively smaller group of NightHawk trainees this Sunday morning, probably due to many of them still recovering from the recent bout of long runs and races, and some nursing injuries to one hundred percent ahead of Sundown on May 26/27. 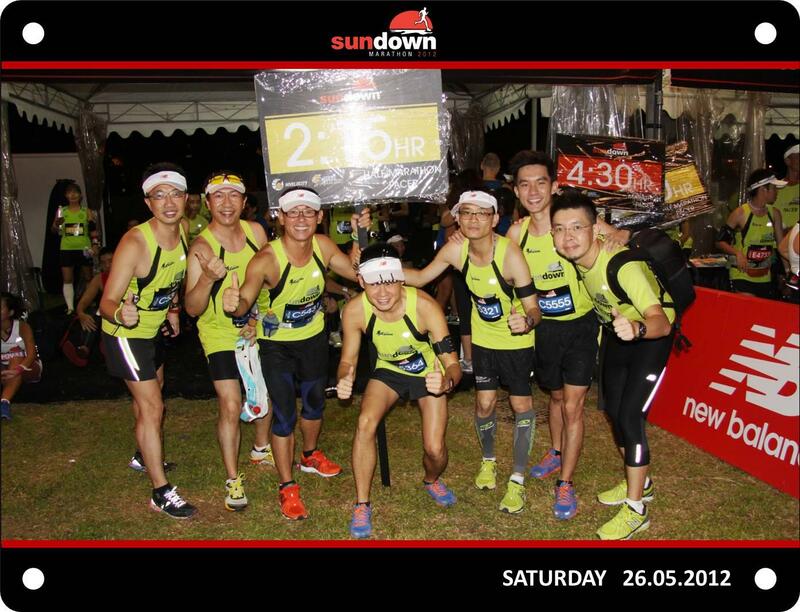 However, the Sundown Pacers and NightHawk crew were almost in full force, decked out in their striking luminous-green race singlets, visors, timing bibs and pace bands for that final rehearsal. 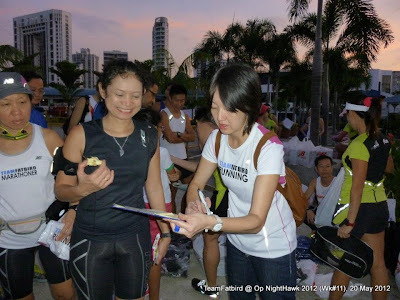 There were lots of administration and distribution of NightHawk training tees and ‘finisher’ singlets, pace bands, interspersed with small group photos….much like a Pasar Malam before the actual Passing-Out-Parade (POP)…yes, once they have concluded the final run, they will be deemed as operationally-ready NightHawks and Sundown Pacers – ready to set the pace and win the race. 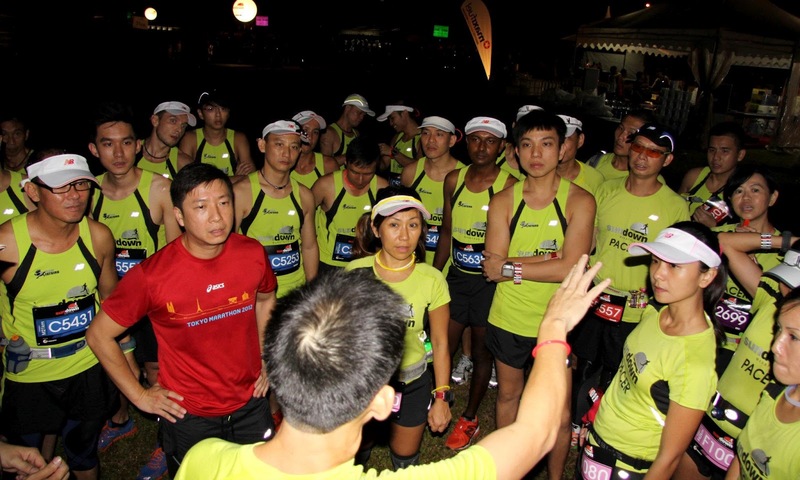 A little more time was spent on race night briefing – the meet-up point, the assembly timings, the pace groups to follow, and overall race preparedness. 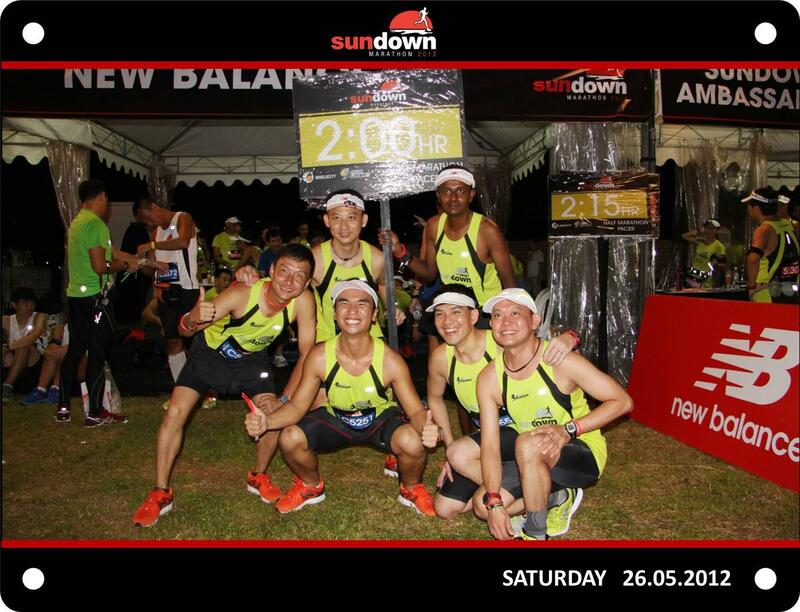 The distances of 13km (HM) and 18km (FM) at Optimal Pace was just the tapering LSD requirement for this morning, something ample to fine-tune race pace yet provide sufficient mileage to keep the optimized engines in good conditions. As it was a full-dress rehearsal, all the Pacers and NightHawk trainees don their race night armour, down to the hydration and fuel systems, caps, and even eyewear for night conditions. 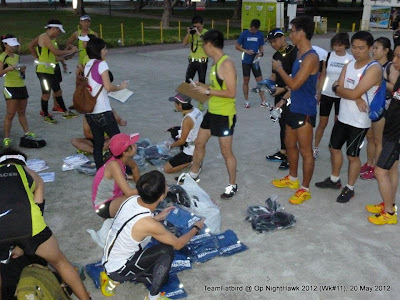 The trainees were proudly wearing their hard-earned NightHawk finisher singlet, testing and conditioning them for race night. We did a wave start since the groupings were smaller, also to facilitate and simulate race night conditions. As expected, the trainees and Pacers were just executing their race plan, trying nothing new, but leaving nothing to chance. The various timing groups were all honed comfortably onto Optimal pace, and the heat from the sun provided additional conditioning to what might be a humid early morning on May 27. The whole session was completed by 10.30am, almost to clockwork on the time-table. A post-run briefing was conducted to confirm our Pace strategies and positioning for the night, and to coordinate meet-ups and assembly points as well. The Sundown Pacers were also celebrating the successful conclusion of their 15-week journey of solid base-building and pace training, along with carrying out many interesting Sundown Ambassador duties and functions. 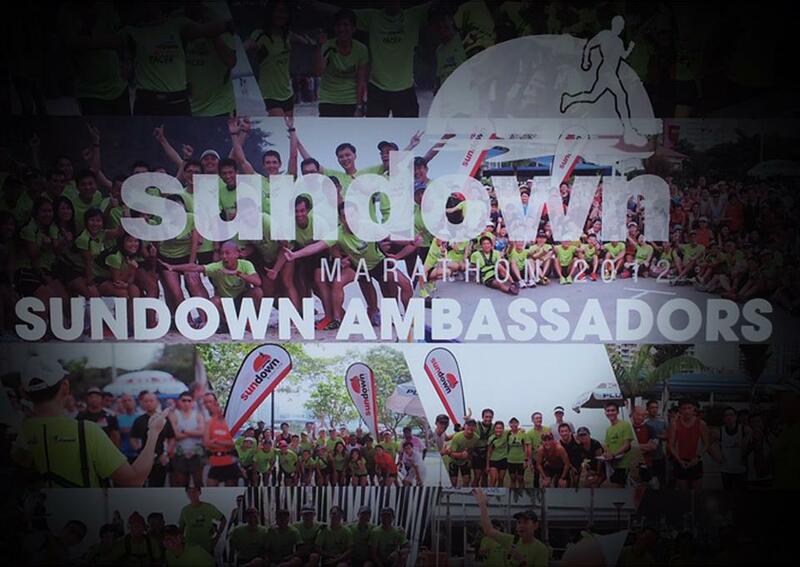 We are sure that the entire Sundown Ambassador team have benefitted loads from our involvement and association with the Sundown Marathon, and are delighted to have had this opportunity and responsibility bestowed upon us. 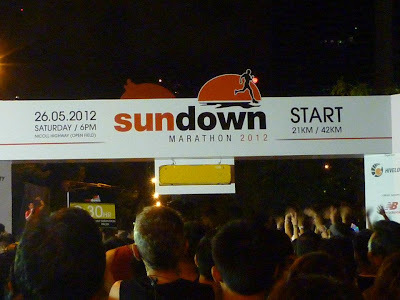 Sundown Marathon Pacers 2012 – Follow Our Pace to Win Your Race! With the 12-week NightHawk program successfully wrapped up, it was heartening to see the progress and performance gains that the NightHawks have achieved…a number of them setting PBs and going on Podiums in the course of training. Many of the NightHawks have also firmed and trimmed down to look like mean-flying machines with friendly smiles and outgoing demeanors. 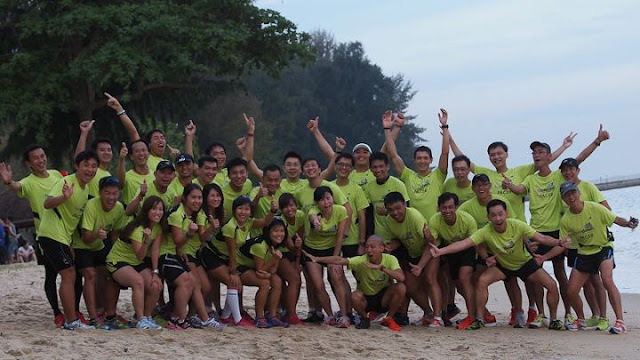 The positive physical and mental changes were obvious in many of the trainees and Pacers, speaking volumes of the effectiveness of the 12 week program and their commitment and dedication to keeping up with training and pacing goals. We are confident that all who have gone though at least fifty percent of the program will have a good chance to Beat The Sunrise convincingly on May 17. 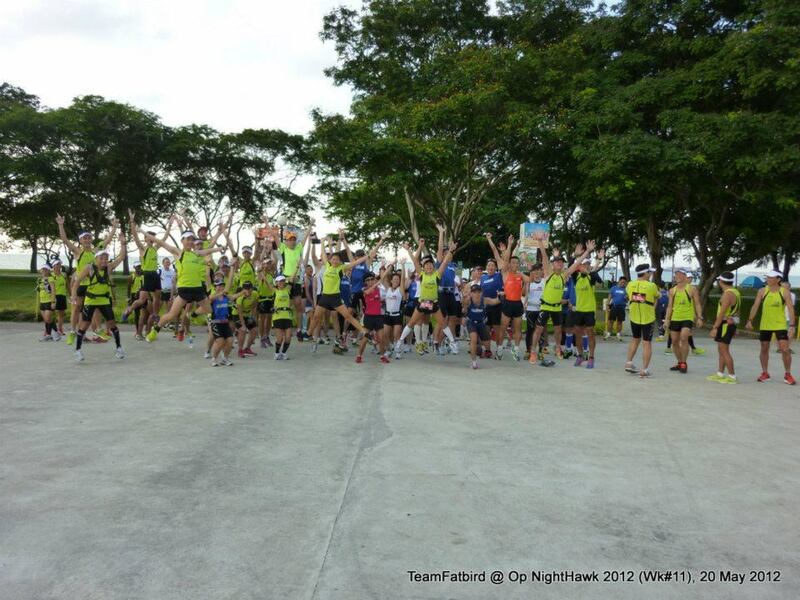 Operation NightHawk 2012 – When The Sun Does Down, The NightHawks Will Emerge….To LIGHT UP THE CITY! 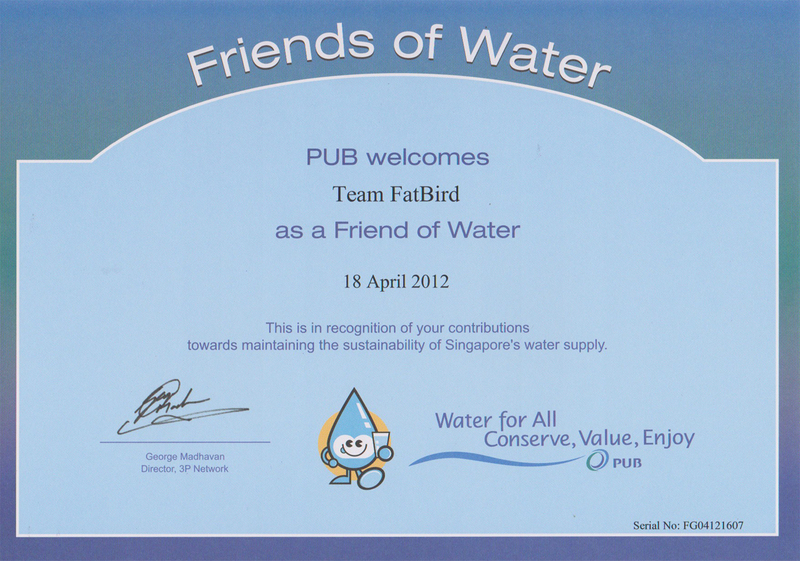 The unannounced parcel that came in the Team FatBird mail was a pleasant surprise – in recognition of Team FatBird’s participation at the Singapore World Water Day (WWD) Celebrations. 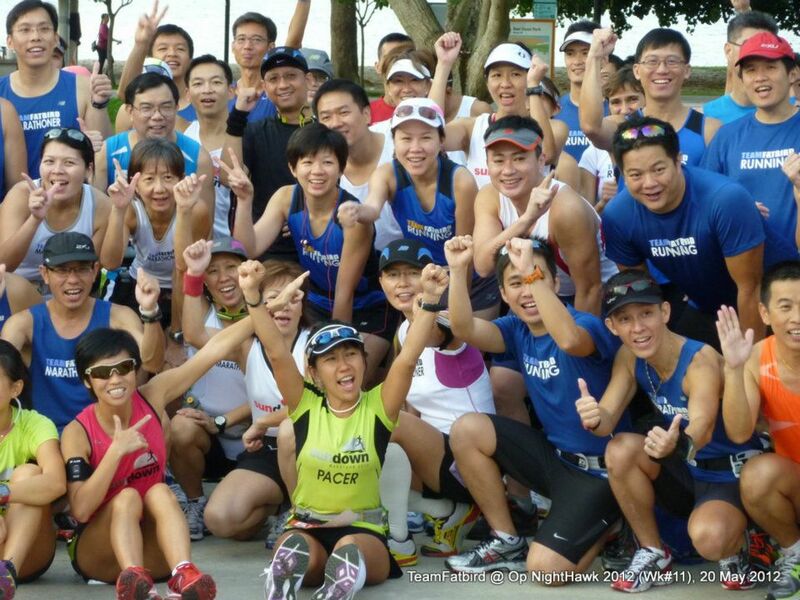 We had lots of fun at the Celebrations Run from FatBird Statue below UOB Plaza to Marina Barrage – read about the morning’s celebrations HERE. 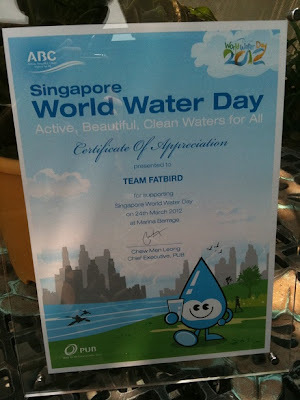 We are honored to be invited as a community partner of World Water day Celebrations and recognized as a Friend Of Water, to be able to do our little bit to promote the importance of water resources and the many Active, Beautiful, Clean (ABC) sites that have been put in place by PUB, our water authority. Team FatBird would like share this special gift of recognition with all FatBirds who made the time to participate in this meaningful run, and also those who have supported and helped to manage the whole event – of a nice photo plaque, CD compilation of the many beautiful photos taken at the WWD activities, a nice plush toy of the WWD mascot, and importantly, the recognition from PUB and the WWD organizers of our team’s active participation in the celebrations which contributed to the success of World Water Day Singapore 2012. 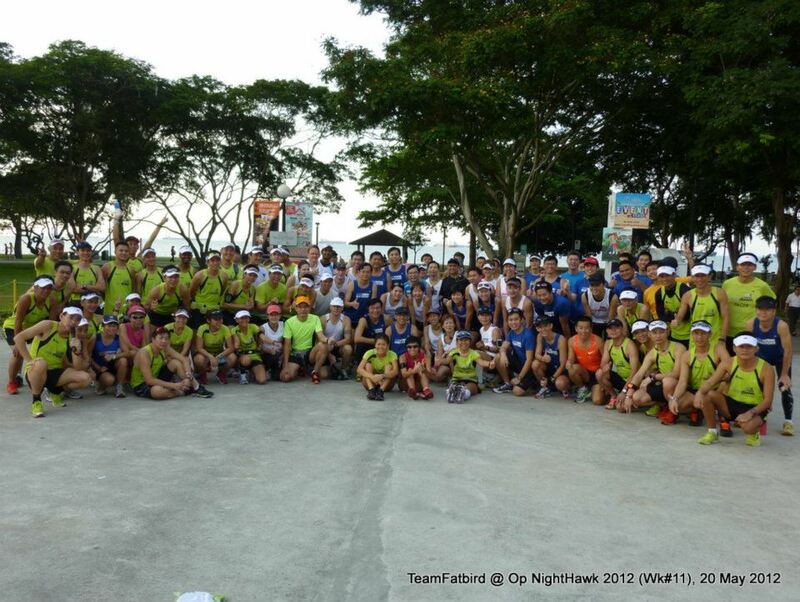 It was the final Night Training Run before the NightHawks taper and go into race on May 27. 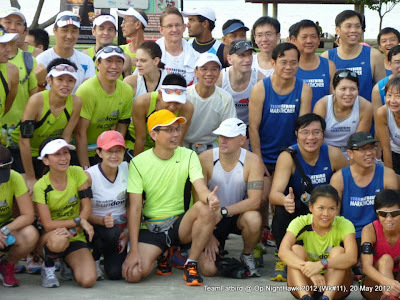 After a busy day at the Sundown REPC, the Sundown Pacers were at ECP with the 100+ NightHawks for an Optimal Paced 18km (HM) and 28km (FM). The Kookaburras, who were in their fifth week of training, and the 3rd Group session with FatBirds were also doing the same distances and routes, albeit still at basebuild territory. 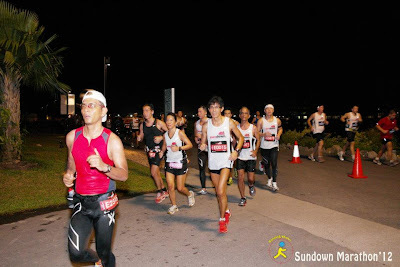 The briefings were kept short, and within 15min, the trainees were into their respective optimal paces, tackling the ECP stretch which will now be a feature of the Sundown Full Marathon on race night. The groups held on their paces well, with many a NightHawk trainee now more conditioned and better equipped for the tasks at hand. 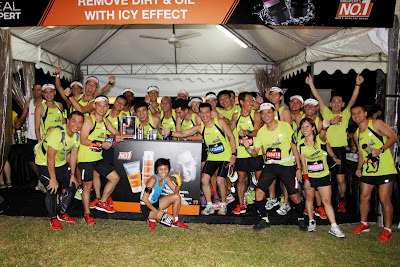 The race plans were put into practice, factoring in water stops and walk breaks where they apply. The respective groups held steady optimal all the way to Sailing Centre, before the HM turned back for their final 6km. The FMers continued on strongly till the u-turn at Changi Coastal Road. 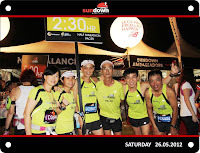 The night was windy at certain sections of the route, while generally it was still humid. We had to contend with cycling groups plying the park connector. At places where we dropped paces slightly due to distraction, we were able to gingerly recover lost ground to maintain average optimal pace. 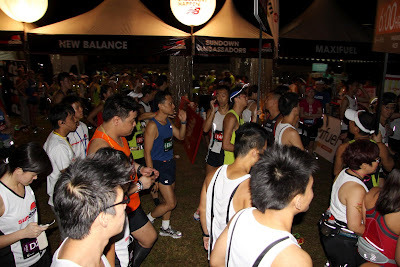 This run was a final trial of sorts for many of the runners as all were aiming to sustain Optimal Pace for about ¾ of the race distances in a night run. The starting paces for all groups were well maintained and with tracking of pace at each km mark, there were regular moderation of the paces to averages close to the optimal targets. Race day lighting and visibility markers were also put to the test – with groups of runners in similar lighting codes, it was pretty visible compared with the use of balloons (which are not really useful in the darkness of night running). We were happy to hear that most of the runners were able to sustain the prescribed distances at optimal pace, lending to the confirmation that the NightHawks have been toughened and sharpened as marathon runners in a short span of 10 weeks. For the few who were not able to sustain the final few km, it was mainly due to the long day on our feet at the RunSwimBike Expo – yet another confirmation of our advise to runners not to spend too much time on their feet (at expos, shopping, visits) one or less day before any marathon race. As we packed and left the C4 Shelter before midnight, there were still lots of chatter and discussions of the night’s run, interspersed with tinges of anticipation and a sense of deprivation as we enter the tapering phase (a lot less mileage, although the intensity will be maintained)…and some runners were even wondering if they would suffer from ‘withdrawal’ symptoms from the lack of fun group runs after the Sundown Marathon. That is sure testimony of the seriousness and dedication of the NightHawks towards the game of marathoning, and again, it is heartening to all the Sundown Pacers and FatBird trainers to see this kind of positive responses and commitment to training, speaking volumes of the care and guidance of the NightHawk Training Team. 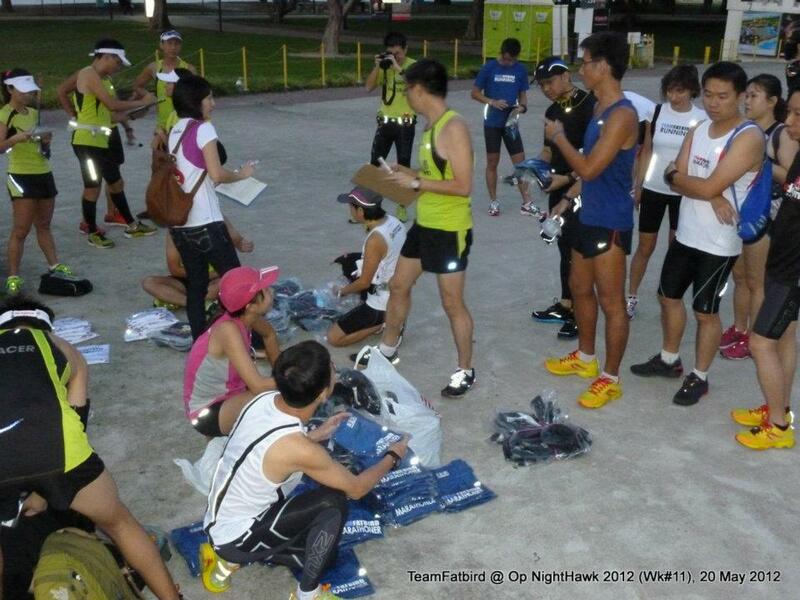 With this final night training run lock and loaded, the NightHawks will be all ready on Sundown Night. 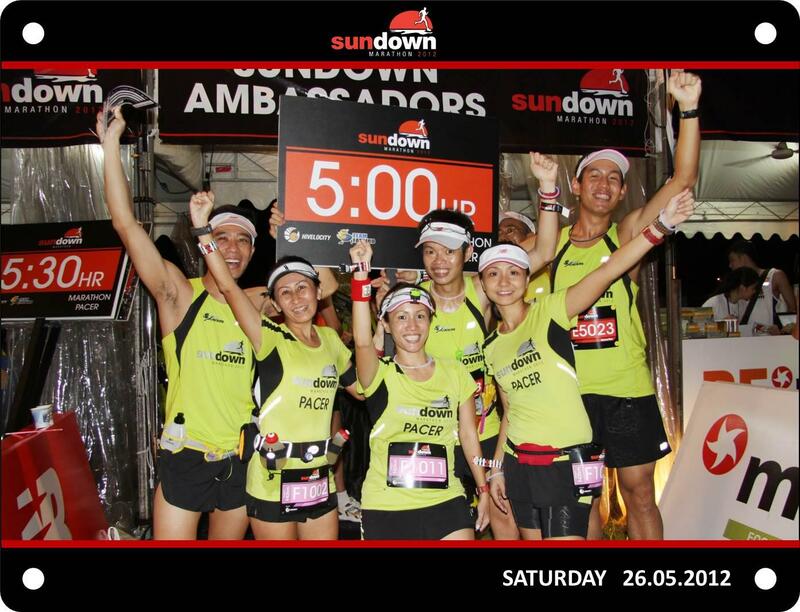 Sundown Marathon 2012, Here We Come To….LIGHT UP THE CITY!